When you’re looking for a unique sofa or couch, one that fits the space and perfectly matches the décor, we’re the people to talk to. Your sofa will be lovingly hand-crafted by local artisans, using a mixture of traditional craft techniques and high-end manufacturing technology. The result is an elegant and accessible product designed for a contemporary audience – all beautiful, simple solutions to complex design problems. Here are our key steps to manufacturing a custom made sofa. This process has been handed down through generations of gifted Italian artisans and ensure that the finished product is elegant, durable, comfortable – and looks stunning. 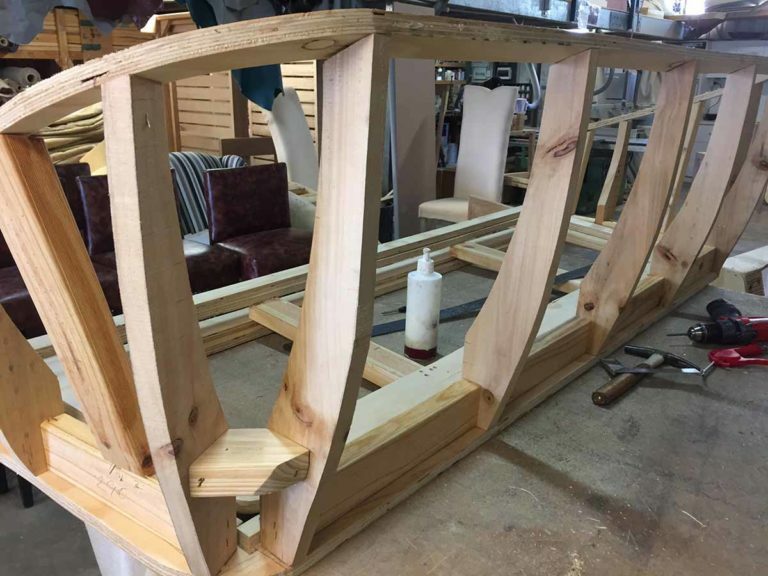 First the frame is constructed from wood that has been found clear of any defects. The thickness of the wood should allow for the heavy tension webbing to follow. If the frame is not sufficiently strong, it will not bear the weight redistributed into it by the webbing whenever someone sits down. Arms, back, or back sections, seat, and legs are attached. The foundation is then set for padding. Jute, a kind of burlap made in India, is used as webbing. Strips of this material are interwoven, stretched across the frame, and tacked down. Flax twine is then used to strap the springs onto the webbing. Two lines of twine are tacked into position and then tied around a spring back to front. Another pair of lines will run side to side on each row of springs after all the springs have been lashed into position individually. Each part is separately padded as well, with layers of burlap and horsehair or chosen synthetic material. The padding is placed in a burlap envelope, arranged on the edge of the seat, pinned into place, and stitched down. As the stitching progresses, the pins can be removed one by one. This roll is then shaped according to design requirements and stitched with special needles and more twine. 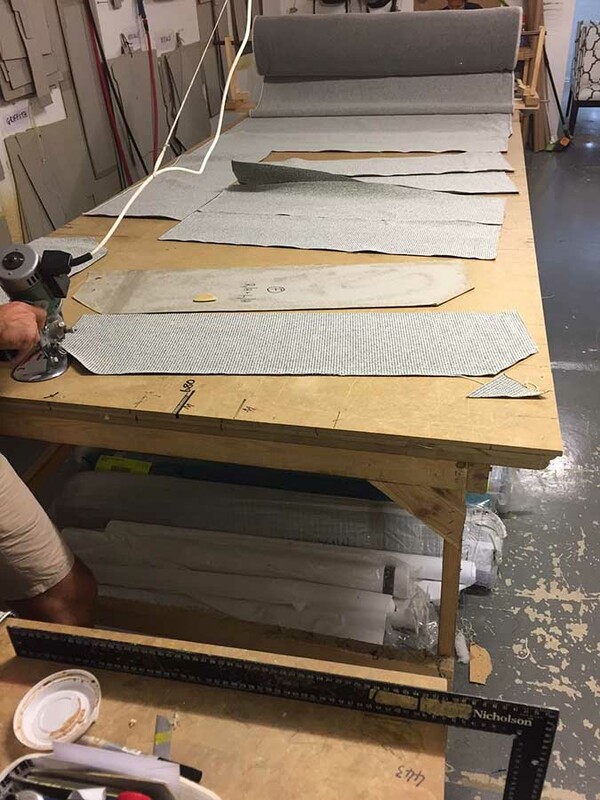 Every piece and panel that will be fabric covered must be measured and recorded in a cutting list. The fabric is purchased in one piece or lot. The panels are then plotted out in chalk so they match wherever their seams will meet when finally applied. If any of the panels and pieces need to be sewn together before being attached to the padded frame, this is taken care of first. The seat is covered with panels for the platform and nose and hand-stitched into place along the break between them over a layer of cotton batting. 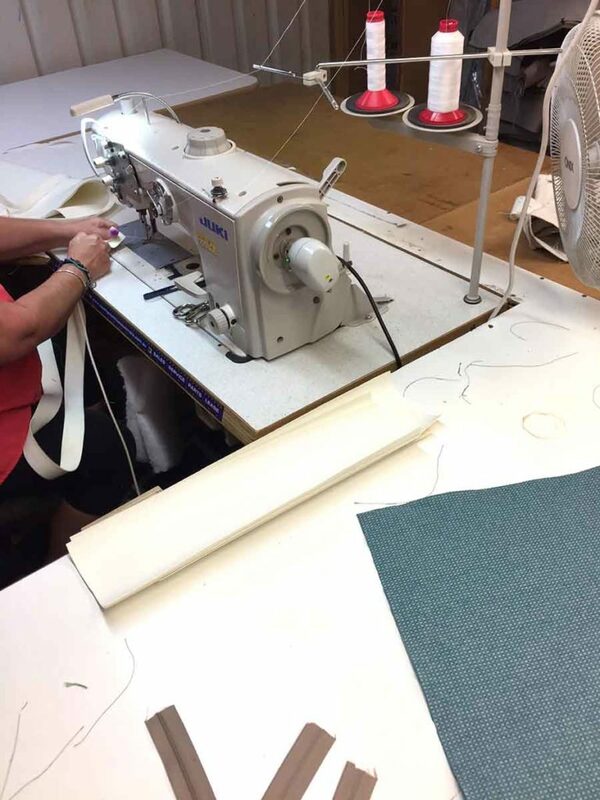 Other parts to be covered like the back or its sections, may require machine sewing and the attachment of pull tabs that will allow the fabric to be stretched between frame slats and secured. After the sofa is flipped and covered at the base with a cambric (dust cover), finishing touches are then applied. The sofa may be fitted with one of several choices of skirt. Arms may be supplied with welted panel covers. Cushions are made separately to cover the seat. And now you have it. Your own masterpiece. All you need to do to make it happen is call us on 1300 030 318. Servicing Gold Coast, Brisbane, Northern New South Wales, Melbourne and regional Victoria.